I never succumbed to the Lululemon craze, mostly because I can't justify $100 on leggings and I never work out enough to make the mileage on these investments. But here comes pretty and always toned Kate Hudson and her new partnership with JustFab for a competitive new women's activewear line, Fabletics. This whole outfit I'm wearing is just $49.95 total. 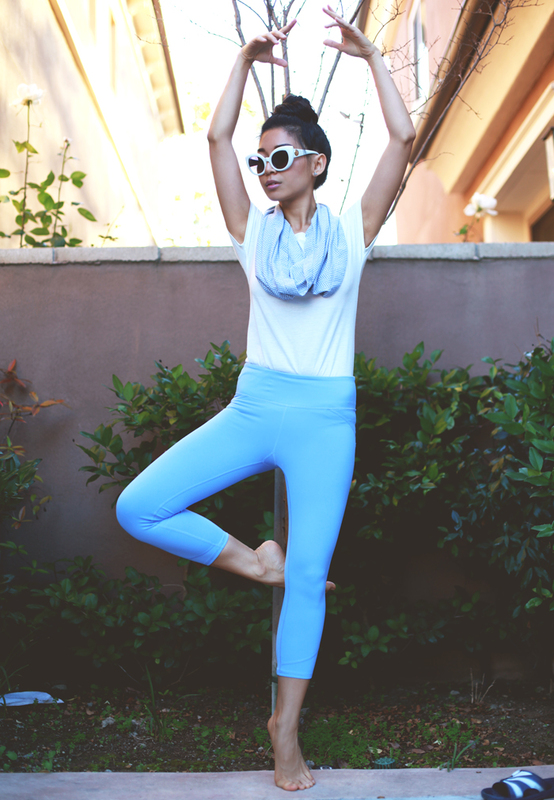 It's incredible and practically a steal because these cute baby blue capri pants are so, damn comfortable and fitted and supportive. Now I see the advantage of wearing these instead of just flimsy little gym shorts to class. And about not working out enough, now I feel more prepared than ever to just step outside and get to some stretching and "yoga-ballet". I say yoga-ballet because I attempted yoga with my sister and yet my moves transitioned to ballet techniques that feel more natural to me. I am so inspired to go back to taking ballet classes just for the fun of it. Sign me up!